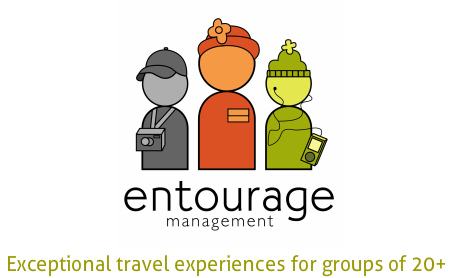 At Entourage, we know that your transportation & accommodations are as important to your trip as all of the fun activities you'll get to do. 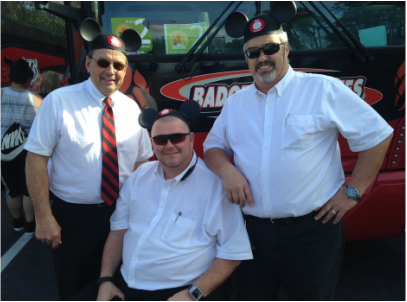 That's why we make sure you have top of line motorcoaches, bus drivers (as seen on the right), accommodations, and even communication with your tour director. We also want to make sure you know just what to pack no matter where your'e going. We'll take care of making sure your trip is as comfortable as possible! You just check out the information and tips below. ​Pack a bag, but not a giant bag! One (1) medium sized suitcase (25” H x 16” L x 9” D) please. If you’re traveling overnight to your destination, pack an overnight bag with a change of clothes & toiletries for the morning. Check out your itinerary & count up outfits! In most cases, you will only have an opportunity for one outfit per day. Casual clothing is usually acceptable. We will note on your itinerary if the occasion requires dressier wear. Pack awesome walking shoes. No blisters allowed on tour. Makes for a lousy day. Students should follow school guidelines for appropriate clothing throughout their tour. They will be representing the school throughout their travels. Visit www.weather.com to check temperatures & the possibility for inclement weather during your travels. Pack accordingly & plan for sunscreen, rain gear, & cold weather garb. Performing groups will be advised by their directors what performance & uniform items are needed. Pack an extra pair of black socks. Those always go missing! ​The motorcoach is your communal living room for the duration of the trip. Keep the coach clean. Be polite. Share. Smile at your bus driver. High five your chaperones. Laugh a lot, but keep the decibel level low. Make yourself cozy on the bus! Bring along a pillow, blankie & sweater. Bottled water & packaged snacks are available throughout the trip (yea)! Participants are welcome to bring along additional goodies. Dairy products or glass bottles are not allowed on the coach. This includes ice cream, yogurt, & blended drinks. In most cases, motorcoaches will be equipped with Wi-Fi & on board plug ins throughout the coach. Wi-Fi can be sporadic while traveling. Plug ins are located every couple of rows on the coach & will be shared. G or PG DVD movies are welcomed on board the coach. PG-13 movies will be shown at the discretion of the chaperones on board. Movies with excessive language or adult situations will not be shown & could be tossed out the door of the motorcoach. Leave those at home. An adult must be on board the coach in order for students to be allowed to board. ​All participants will be invited to join in a Remind Text Messaging Group for the tour that they are traveling on. Participants on the trip will receive text timeline reminders throughout the tour & any directives necessary for the next step in their travels. Parents can also sign up for a What-Is-My-Kid-Up-To Text Messaging Group so that they can keep track of their child’s adventures! Our tour directors will send out periodic messages to parents to advise them of where the group is, what exciting things they have seen & how the day progressed. Details on how to sign up will be listed at the top of your final itinerary. You can also download the Remind App when signing up so you can easily access messages and send questions to your tour director.